The subjectivity of the taste of cheese. Some people like cheese and some people don't. Some people like some cheeses and don't like others. And everyone would agree that liking or not liking something is subjective in some sense. Actually it's difficult to say exactly what that sense is. I'd say that it's a matter of how one is supposed to behave when a person expresses a judgment about what they enjoy or want. If someone says that they like or don't like X, or want or don't want it, as a matter of good behaviour, one should not contradict that statement. It's really not polite to deny that a person likes or wants something if they tell you that they do. This goes quite deep into the way we think about politics and the fundamental aims of society. It is conventional to think that people have wants and likes as a fundamental given, that it's meaningful to talk about the aggregate degree to which these are met, and that society should be evaluated on high it scores on this 'utility' scale. Personally I think there's a lot wrong with this conventional way of understanding the goals of society - see for example Review of 'The Righteous Mind'. (Hah! - I've managed to make a connection that last week I said was impossible.) But let's get back to cheese. Let's suppose that someone, let's call her Katherine, says that Brie tastes like cauliflower. (As so she did a couple of weeks ago.) Now I'm not sure how you react to this statement. My reaction was, yes I think that's true, but I didn't immediately accept it, I had to eat quite a lot more Brie, and some cauliflower. 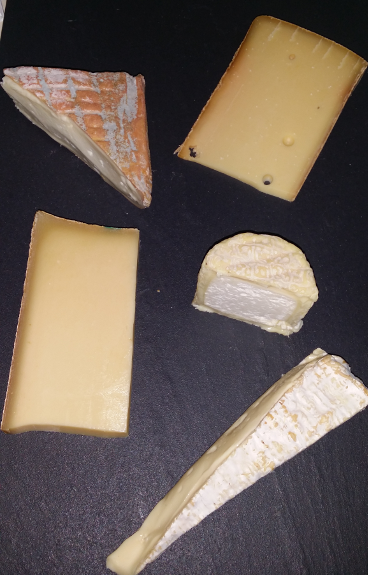 And I asked a cheese expert (the very well informed person who works in Mons, Bermondsey Spa). She strongly agreed, adding that it also evokes cabbage, and sometimes even Brussels Sprouts. Now I'm sure, but for a while I was uncertain. At the same time someone else, let's call her Julie, says that Gruyere tastes like soap. I didn't have to puzzle much over that: No it doesn't. Might these statements have been more subjective if they were 'Brie tastes like cauliflower to me' and 'Gruyere tastes like soap to me'. Yes, they are more subjective - but, like I said, it's not clear what that means other than it would be very impolite to deny them if someone expresses them. It is not that they have to be true just because the person who utters them believes them to be so. There is no guarantee that just because I believe that Brie tastes like cauliflower to me that it Brie really does taste like cauliflower to me. There was a period when I was uncertain about this, and I can still envisage changing my mind in the face of more experience, argument, or authoritative opinion. Judgments about one's own likes and desires are similar to this, I think. Through gritted teeth, I also have to accept that I could, in principle, come to revise my judgments about Gruyere and soap.